At the produce store, I noticed packages of dried white figs. I have bought them before and like eating them just as they come from the package. But I was in the mood for muffins. Then, seeing a banana on the counter, I decided I would toss it into the batter too. I was more than happy with the results. 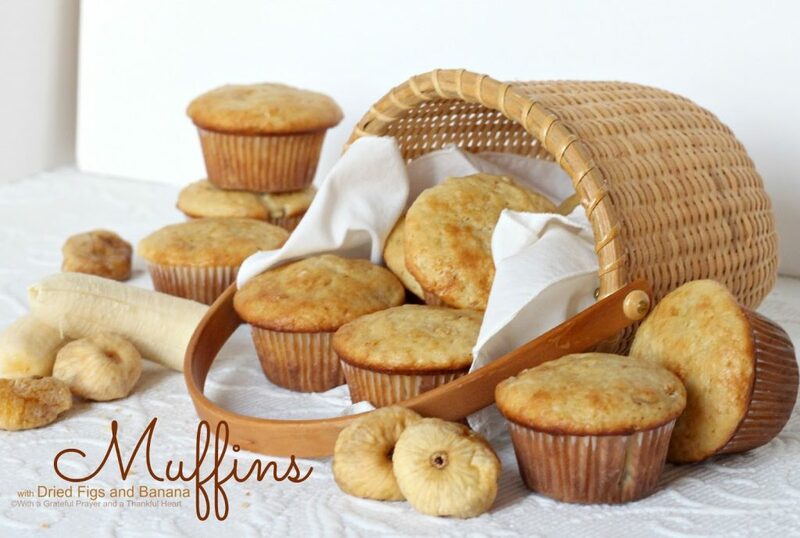 Yummy muffins dotted with sweet, chewy bits of fig and full of banana flavor. spray or grease the top of 2 standard 12-cup muffin tins. Line with paper baking cups. In a large mixing bowl, add flour, baking powder, baking soda, salt and sugar. Whisk well to be sure all ingredients are evenly distributed. In a medium bowl, whisk together the melted butter, applesauce, milk, sour cream, eggs, egg yolk and vanilla. And the wet ingredients into the dry, folding gently with a rubber spatula just until dry ingredients are almost moistened. Add the chopped figs and banana, folding in, being sure not to over mix. Bake in preheated oven for about 27 minutes or until toothpick inserted comes out clean. Allow to cool on rack for 10 minutes before removing. *NOTE: I used homemade, sweetened applesauce in this recipe so 1 cup of sugar was plenty. It is probably best to used unsweetened applesauce and add the sugar to your desired sweetness preference. I think adding pecans or walnuts would be a nice addition but this time I didn’t want to add extra calories. They sound delicious! Yes, I would add the pecans. 🙂 Having those with a cup of coffee would be a wonderful breakfast! Muffins look and sound delicious. I like figs right off the bush! I certainly like the sound of the chewy bits of dried fig – yummy!! I haven't seen the white figs. They are so beautiful! What a flavor combination. I haven't made muffins in such a long time. Sounds fabulous. Your muffins look delicious. I bet the flavor combination was really good.